Hamid has moved from inside the ring to teaching boys outside it. Egyptian hero has had to deal a right hook to preconceptions about women and boxing. BUENOS AIRES: When Nadiya Abdul Hamid, a seven-time Egyptian national champion, hung up her boxing gloves almost a decade ago, she turned her talents instead to coaching. Yet even while she last week became the first Arab female to train athletes at an Olympics, at the Youth Olympics in Buenos Aires, Hamid feels she is still fighting daily for the respect she deserves. Hamid is a 29-year-old who gives little away, likely the result of a career in which she has been forced to overcome cultural subjugation and sexual discrimination since the day she first entered the ring 15 years ago. A late starter at 14, she quickly learnt the ropes and finished fifth at the 2008 International Boxing Association (AIBA) World Championships, competing as a light-heavyweight. Since receiving an invitation in 2009 to work alongside a new Cuban coach hired by the Egyptian Boxing Federation, Hamid has slowly negotiated her way through the system, eventually in 2016 earning the role of head coach of her country’s youth team. Two of her fighters won bronze medals at the World Youth Championships in Budapest in August, while at the African qualifying tournament for this month’s Youth Games, her fighters won all three slots available to them. Youssef Ali Mousa reacts after the points decision against Britain's Karol Itauma went against him at the Youth Olympics in Argentina. In Argentina and working alongside coach Said Hassan, Hamid watched from the corner as all three of her fighters reached the semifinals. When Youssef Ali Moussa lost harshly to eventual gold medallist Karol Itauma of Britain, it was she who carried the tearful young man back to the training area. 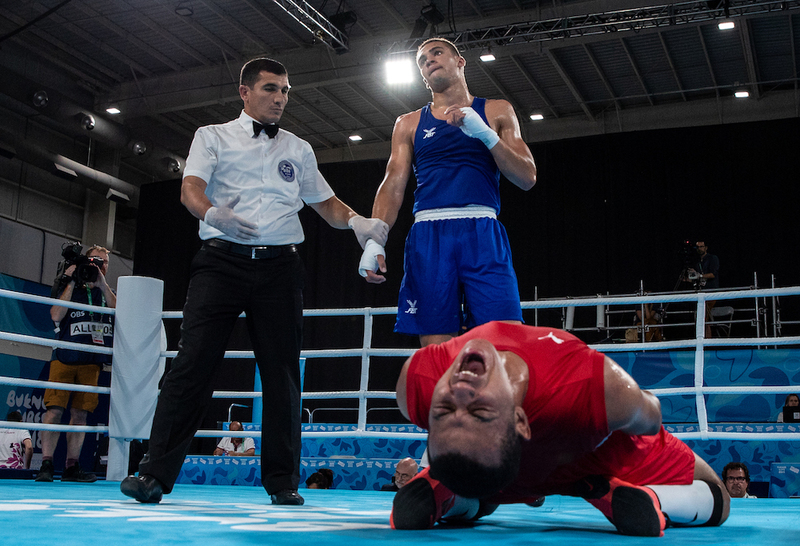 Marwan Madboly and Ahmed El-Sawy Elbaz also lost in their final-four bouts, but Elbaz recovered to beat Canada’s Tethluach Cguol and secure a bronze medal. Hamid said one of the most positive developments of the past eight years has been women in the Middle East beginning to make their voices heard, pointing to Sahar Nasar, her government’s investment minister. Hamid hopes her chance will lead to the fulfilment of a dream she has retained since the first time she donned training mitts. For while people often speak of athletes setting objectives around Olympic Games, coaches are no different.